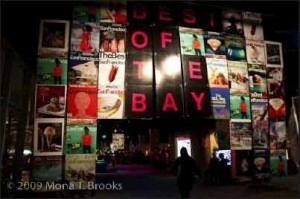 Best of the Bay—Beyond Compare! The long-awaited issue has finally come…San Francisco Magazine’s Best of the Bay 09 is here! I recently attended the grand fête and the sparkle of the evening is still in my eyes. 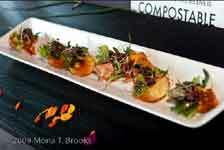 Aperitive amuse bouche, luscious libations, rhapsodic rhythms—luxe, luxe, luxe. Have you ever been to a party that was so amazing that you had a permanent after-glow for days on end? Well, that’s what Best of the Bay did to me. 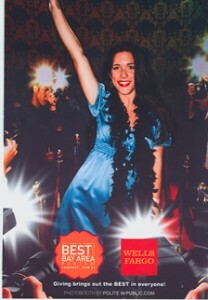 This was my first year to attend this outstanding party and San Francisco Magazine absolutely blew me away! 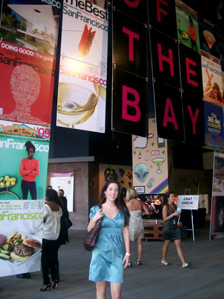 I was overwhelmed with delight when I found out I would be going to the Best of the Bay Area party, especially considering I had only been in San Francisco for three weeks. 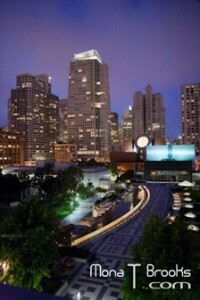 Having already fallen head over heels for this city, I knew that a haute soiree at the Metreon featuring the best food, drinks, and beats San Francisco has to offer was only going to further intoxicate me with her magnetic charm. I was lost as soon as I walked through the door—San Francisco, my heart belongs to you! As I walked in I prepared my palate to be swept off its feet by the vast array of sumptuous hors d’oeuvres and confections. Names of all the great restaurants in San Francisco surrounded me: New Delhi Restaurant, Paragon Restaurant & Bar and Betelnut, just to name a few, paired with the free flowing wine from Sonoma Valley Grapes and Wine vineyards such as: Westwood Winery, St. Francis Winery & Vineyards, Muscardini Cellars. The pièce de résistance of the evening was undoubtedly the lamb skewers from Betelenut and Kara’s Cupcakes provided the perfect denouement to an evening of culinary indulgence with their ambrosial carrot cake cupcakes. My senses were captivated with the beauty of the view of San Francisco from the Metreon, the aromatic fragrances of tantalizing treats that only the word divinity can come close to signifying the caliber of, and the heady perfume of a musical mélange dominated by the hits of the late great Michael Jackson, which enticingly beckoned guests to the dance floor. It was as if I was being enveloped by the allure of San Francisco’s magnetism. Synesthesia is the only way I can describe it. As the exotic medley of spices and flavors rolled over my tongue, as my eyes were delighted by the breathtaking views, as my body was compelled to move to the rhythms of the music, I felt myself being swept away by the pure magic of the evening, by my love for this city I wish I could call home (and hope one day to be able to) and by a new-found sense of self. It was absolutely exquisite. To add to the delight of the evening, proceeds from the event go to Family House, a non-profit organization that works to provide temporary housing to families of seriously ill children receiving treatment at the University of California San Francisco Children’s Hospital. So as the money piled out of the wallets of the guests for donations, raffle tickets, and silent auction bids it was with the knowledge that their money was going to a wonderful cause. I couldn’t imagine a better way to spend my evening or my money than at a party which not only boasted excellence in every capacity, but also provided much needed funds for families experiencing unimaginable ordeals. Luxury is something that can easily be bought, but a marrying of luxury and humanity now that is something to be valued. was never a moment when I wasn’t smiling. Since arriving in San Francisco it is like I have been on a permanent natural high, and the Best of the Bay area represents the height of my experience thus far. It is a night which will live in the pages of my memory forever as the evening when this Texas native felt an insatiable pull to become a California girl.